To generate a new purchase order from the Side Menu > Create New > Purchase Order, follow the steps below. Select Purchase Order from the menu. Click on the Drop Ship checkbox if the PO will be shipped directly from the Vendor. The system allows you to drop ship items directly to your customers and track them. 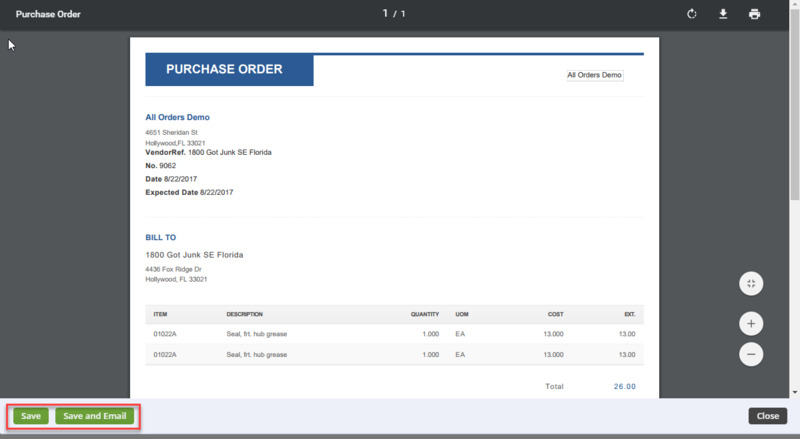 Track drop ship orders by selecting Purchase Orders from the Open Full List drop-down menu. You can either enter a PO # or select a vendor from the listing. When the POs are listed, use the filter option (Gear icon) and select Drop Ship from the menu. Under Operator, select "equal to" then select "True" under Criteria. Click on Save when done. 6. Under the Custom tab, you can specify if the PO is part of a Job, Assembly. The Custom tab can be customized to your preferences. Specify if this PO is part of a Job #. Type an Alias if needed (i.e. Bicycle components for customer X, or a Number of your choice). Under the Items tab, enter item number or name. 2. The cost will auto populate. You also have the option to change pricing as needed. You have the option to select item identification by using the drop down menu and selecting the appropriate identifier (i.e.Name/Number, Description, UPC, Manufacturer Part Number, Vendor Part No.). 3. Click Save to move on to the next item. Once you have selected and saved the items for PO, the screen will display the the items description, quantity, UOM, cost, Quantity Unfilled, Filled. The Tabs on screen can be used to review or add information for your PO. These tabs are valuable tools to track your Purchase Orders. You can view or add a memo/internal notes to communicate with other employees who are viewing the PO. Under the Dependency tab, you can view if the PO is tied to Sales Orders. Open Activity and Activity History tabs can be used to review the vendor's activity history. The Activity History tab can be a helpful communication tool for your business and vendor. Under the Activity History tab you can send an email to your employees or vendor. The conversation will be recorded for tracking purposes. Processing: Purchase Order processing means you are in the process of recording PO Inquiries. Generating those inquiries into “firm orders” will require the completion of necessary documents to permit PO to be fulfilled. Approved: Purchase Order has been approved. Sent: Purchase Order has been approved and presented to the Vendor. Voided: Purchase Order has been voided. Closed: Purchase Order has been closed. When you are ready to process the Purchase Order, select Approved or Sent from the status drop down menu . You must change the the PO status to Approve or Sent for the Purchase Order to be received. The approval process will depend on your company's Purchase Order approval setting. Manager's approval might be required for approving the Purchase Order. The manager will receive a notice to approve. A Purchase Order can be printed and email to your Vendor. Clicking on the Create PDF icon next to the Purchase Order number. A pop-up window will open and you can select Save and Email icon. 2. The Send Email screen will pop up, fill the information as requested. You will have the option to attach additional information, carbon copy individual in your company. An email template is provided, select appropriate template from the Template drop down box. 3. The next step will be to receive the Purchase Order. (See Receiving for more information.). A Receiving Doc can be generated when the PO status has been Approved or Sent to the Vendor for fulfillment. In the Purchase Order screen under the Receivers tab, click on the +Receiver button. The next screen will provide the warehouse receiver a Receiver Doc to complete. The screen will provide the warehouse receiver an option to inspect, review, accept, denied or return to vendor if damaged when Purchase Order is received. (See Receiving article to learn more about creating a Receiving Doc for Receiving items in a Purchase Order. ).